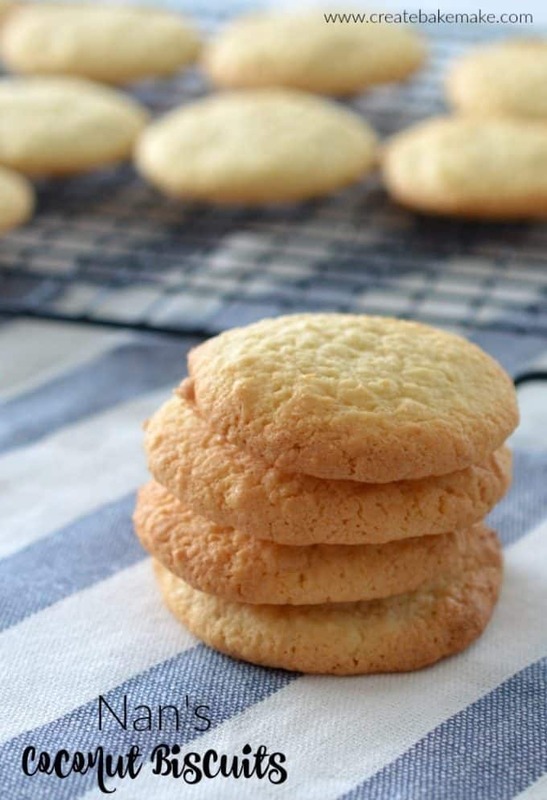 This recipe for my Nan’s Coconut Biscuits takes me back to when I was a kid and we used to spend our weekends at Nan’s house helping her in the kitchen. 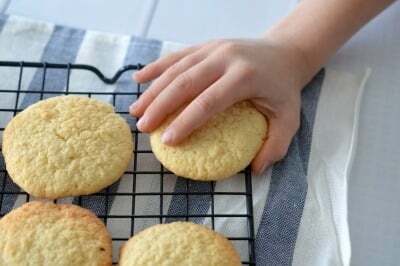 I love that my boys now help me make these Coconut Biscuits and I hope they grow up with the same lovely memories as I have. 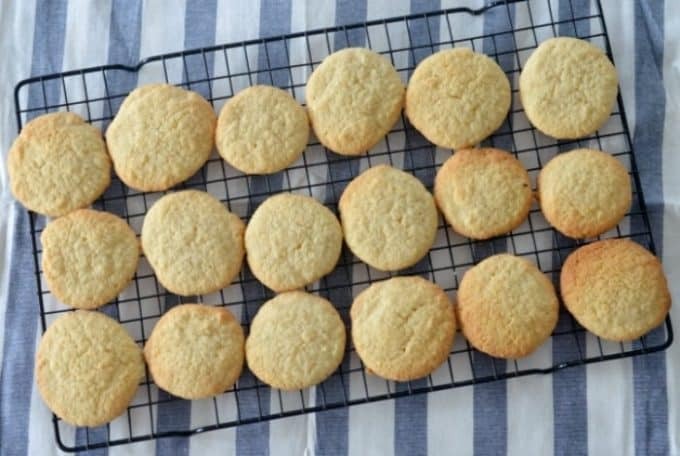 I was stoked when a few years ago I came across this recipe for my Nan’s Coconut Biscuits in one of my Mum’s old recipe books, as they were (and still are) one of my favourite biscuits. Like most of Nan’s recipes, these are really simple to make and you only need five ingredients to put them together. I apologise that the measurements for this recipe is only in grams and not cups, the reason for this is I had to convert the measurements from ounces – yep this recipe is really that old! 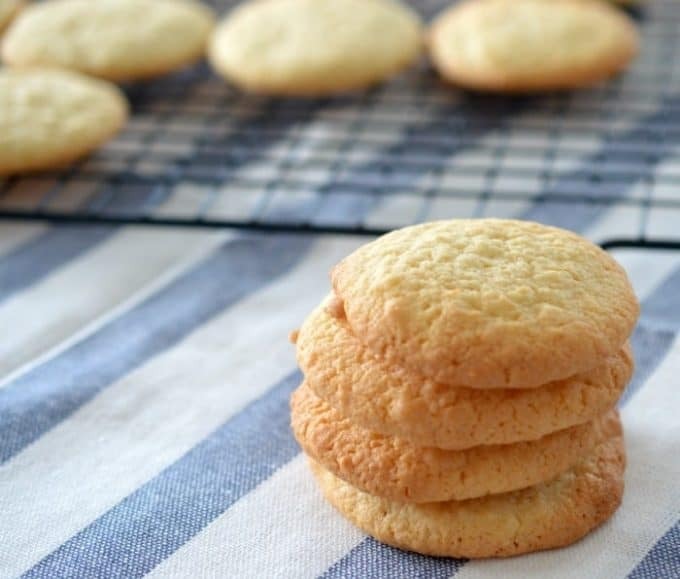 These Coconut Biscuits are really light and buttery and this recipe is on regular rotation in our house as both of the boys love them (Mr 4 calls them the best bikkies ever!) and the only problem with them, is that they never seem to last very long. They make a great lunchbox treat or after school snack and I can guarantee you will have trouble stopping yourself from eating just one! If you don’t have a Thermomix – don’t worry! You can find the conventional cooking method here. 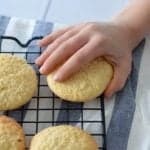 These easy Coconut Biscuits need just five ingredients to make and make a great snack or lunchbox treat! Thermomix instructions also included. Line two trays with baking paper and preheat your oven to 190 degrees. Insert your butterfly into your Thermomix bowl and add the butter and sugar. Mix for 30 seconds on speed 3. Scrape down the sides and mix for a further 10 seconds until pale and creamy. Add self raising flour and coconut to your Thermomix bowl and mix for 30 seconds using kneading function. If the mixture hasn't quite come together, mix for a further 15 seconds using the kneading function or until combined. Use a dessert spoon to place the mixture onto the trays, don't worry, your mixture will be quite runny. Repeat until you have used all of the mixture. Place the trays into your pre-heated oven and bake for 15 minutes or until a light golden colour. Remove Nan's Coconut Biscuits from the oven and cool on trays for 5 minutes before carefully transferring to wire racks to cool completely. Don't worry if your mixture is runny, these biscuits will 'set' once baked. I love Nan’s recipes!!! These sound like the perfect go to biscuit as well. Thanks for sharing with YWF. Nothing better then a recipe that your Nan used to make. Oh yum Lauren! These look amazing! Today I had the foresight to eat my brekkie before I opened your blog. Otherwise I’d be rummaging around for cookies for breakfast. I have been on a bit of baking frenzy (for me) lately and I am pretty sure I have all the ingredients in house to try these out next week. Yum! Yum! I miss coconut things 🙁 I moved to the US from Sydney about a year ago and the coconut here is not desiccated… I’m not sure what it is except ultra sweet and a little strange so I steer clear now. These biscuits look delicious! I used to help my Grandmother make pizza dough when I was a kid. it was so tough not to keep peaking under the tea towel to see if it had risen yet. Hi. These are delicious. My batch wasn’t runny tho. Taste great so must be ok.
My mix wasn’t runny either, quite the opposite in fact, but they turned out great. Not really crispy like a biscuit, but more ‘cakey’. Will definitely make them again!